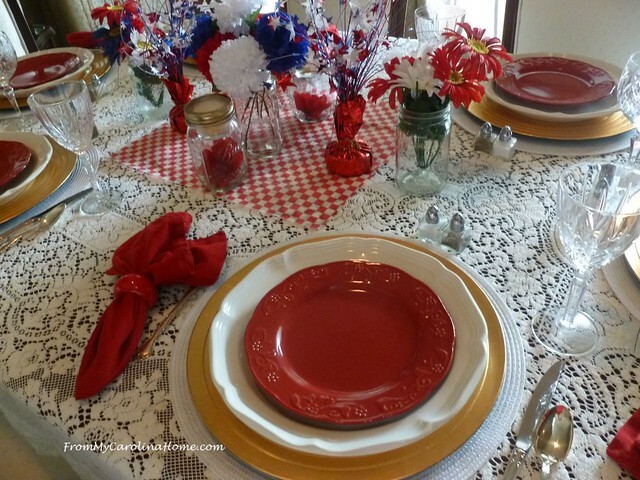 This year, I thought I’d do my patriotic table with a vintage theme. 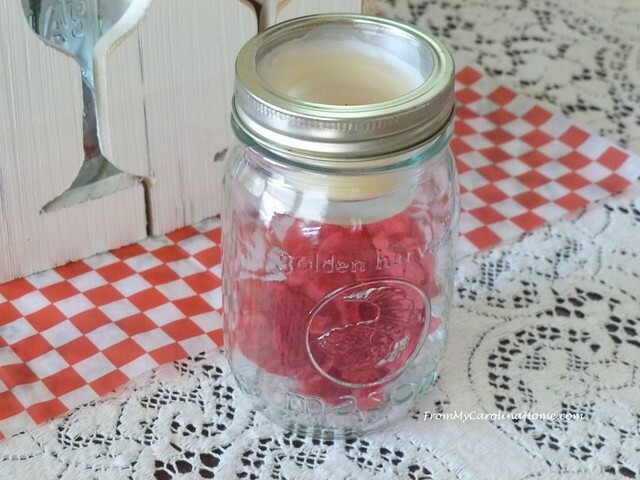 I had these Bell canning jars and a vintage-style milk crate for inspiration. It would be something a bit different than the usual flags for July 4th. Plus, making the table fresh and new from previous years using only what I had on hand was a bit of a challenge. 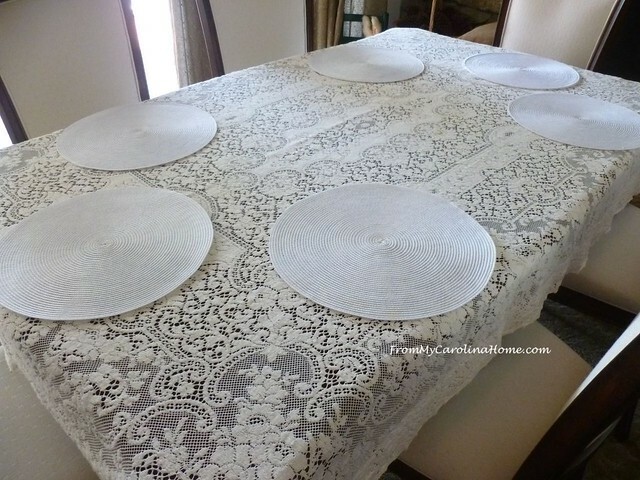 My grandmother’s lace tablecloth became the base, with white placemats placed on top. The place settings have a gold charger, a nod to the gold in our NC state flag. 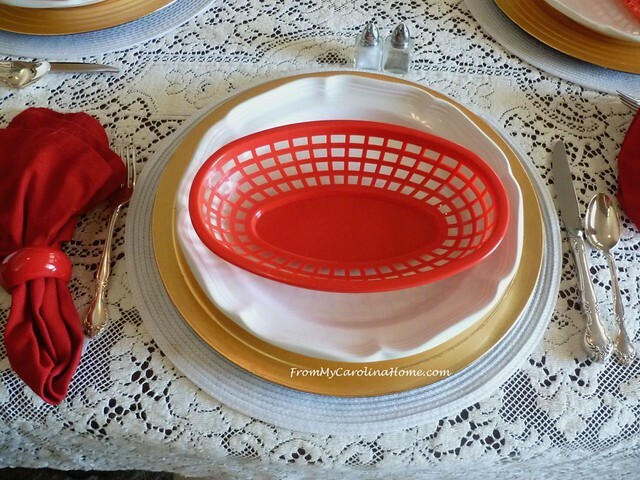 White plates are topped with plastic baskets, remember these? We used to get our burgers in them at the drive up burger place when I was a kid. You don’t see these much nowadays, but I found some in a thrift store last summer. Simple flatware, just a knife, fork and spoon. 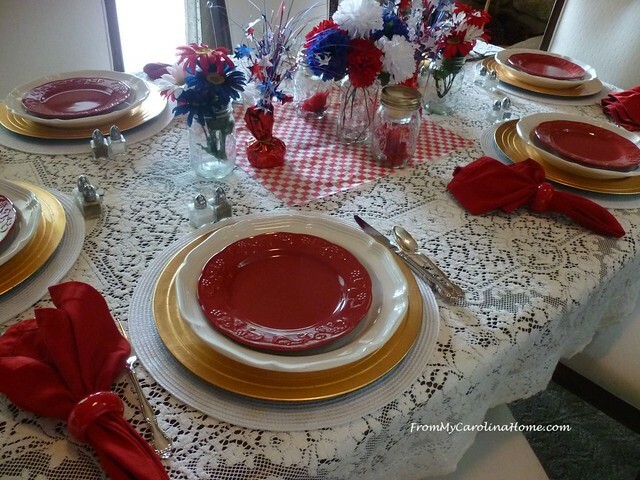 Red napkins are held with simple red rings. 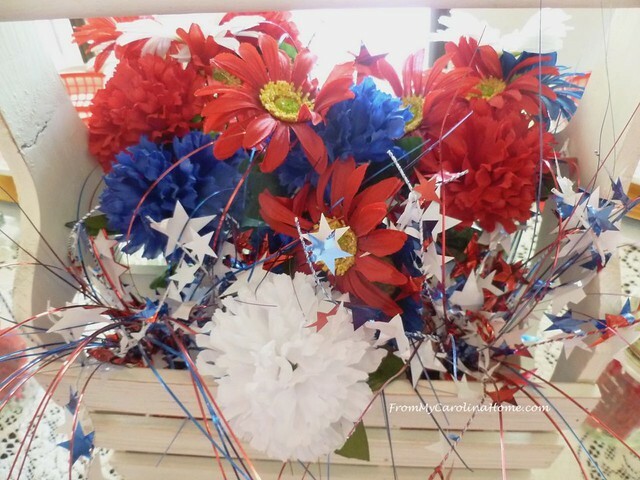 In the milk crate, I placed Ball jars in three slots, and filled them with red, white and blue silk flowers. The other three slots hold the star sprays I’ve had for some time. The dollar store provided the checkered waxed paper for the baskets, and I put one piece under the crate for a bit of extra color. I realized later that I hadn’t put the glasses on the table for the pictures, LOL!! Oh well. On the sides of the centerpiece, I put mason jars with the votive candle holders. The little glass votives with the flared tops fit exactly, and the ring screws down over them to keep them secure. I can change out what is in the bottom for color. Read about how I came up with this idea HERE. Because the meal is a cookout, I kept it simple. Mostly red and white, with just a touch of blue in the centerpiece. Burgers on the grill, yum!! 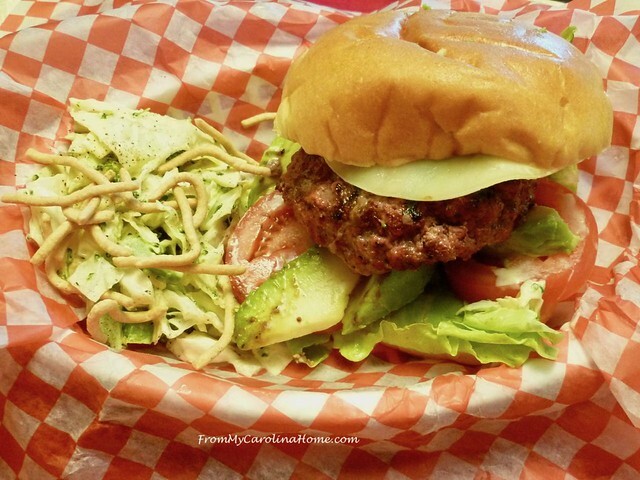 These had lettuce, tomato, provolone cheese and avocado slices on brioche buns. I made the Asian Broccoli Cabbage Slaw to go with it. Then, plans changed, and we decided to have a dinner inside. I had a ham to cook for a few friends over the weekend, and it is just too humid and hot to sit on the veranda. I changed out the baskets for red salad plates. Then the centerpiece was taken apart and spread out to lower the height. It still has a vintage feel. Wine glasses are added too. 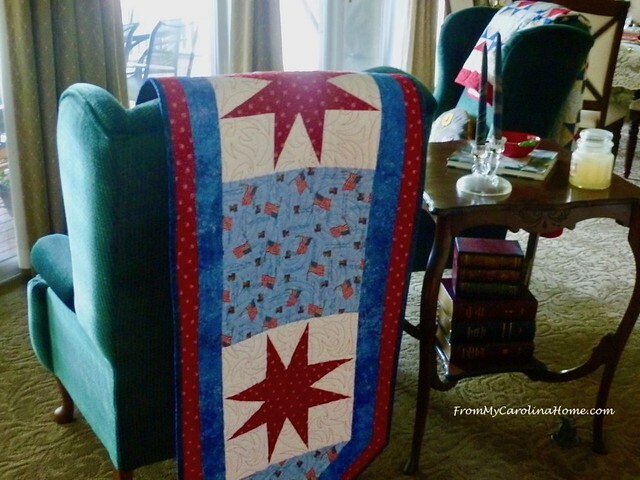 The Patriotic Table Runner is doing a different job this year, hanging on a chair as a decoration for the holiday rather than on the table. We needed a holiday tablescape for the pub table too. Red chargers hold white dinner plates with red salad plates. 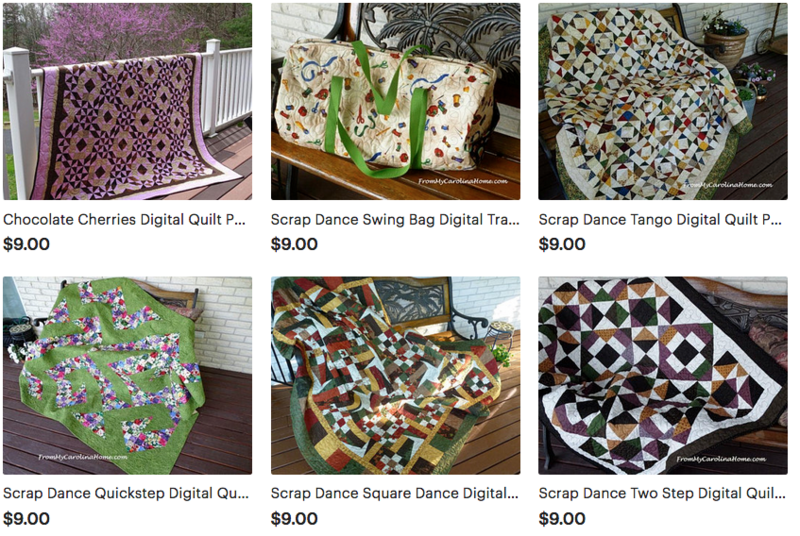 My Scrap Dance Tango table topper in patriotic colors is in the center. 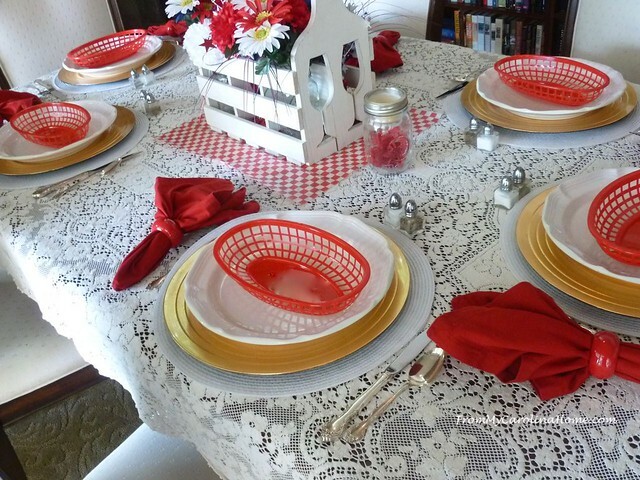 White embroidered place mats are paired with white napkins and red napkin rings. More silk flowers in Ball jars along with a star spray make a simple centerpiece. Everyday flatware and pretty glasses complete the settings. I added wine glasses to the table for an evening meal on Sunday, when friends were in town. I usually try to put something on the stem to help friends keep track of which glass is theirs. This time I used little leftover bits of star garland, and some sparkly pipe cleaners. For those who have Amazon Prime, the big deal day is coming up on July 16th. 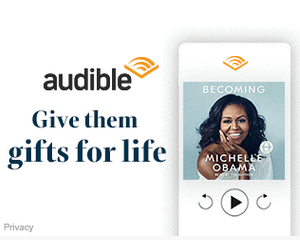 If you don’t have Prime, you can check it out by clicking on the banner below. There’s a 30-day free trial available, and you’d be a member when the sale day comes. You have time to join before this huge sale happens, and be able to enter the giveaways. Its only one day a year. Now ready for dinner, my melamine serving bowls and platters will come in handy. Happy Independence Day to my USA readers. For international readers, have a great week! 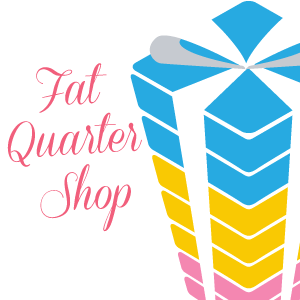 Check out today’s holiday Flash Sales at Fat Quarter Shop. The deal changes at 10 am. 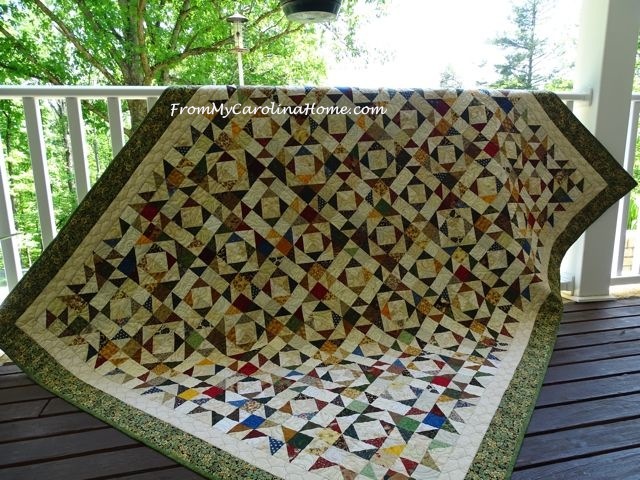 Craftsy is having a Family Fun special too! How are you spending your 4th of July? Very inspirational — Happy Independence Day! It looks so festive. Happy 4th. 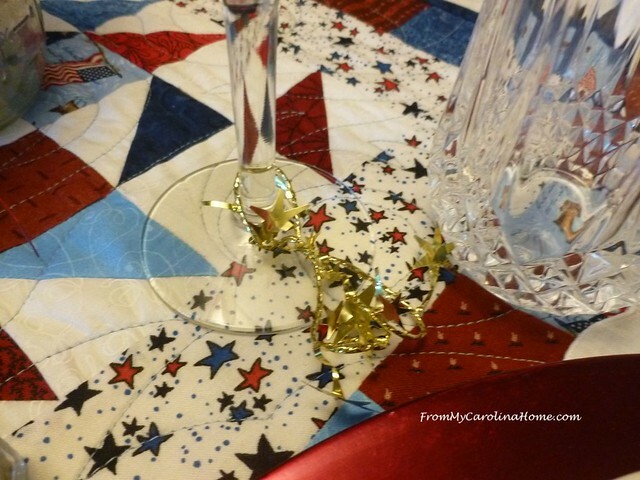 You have the most fun ideas for table decorations, Carole! 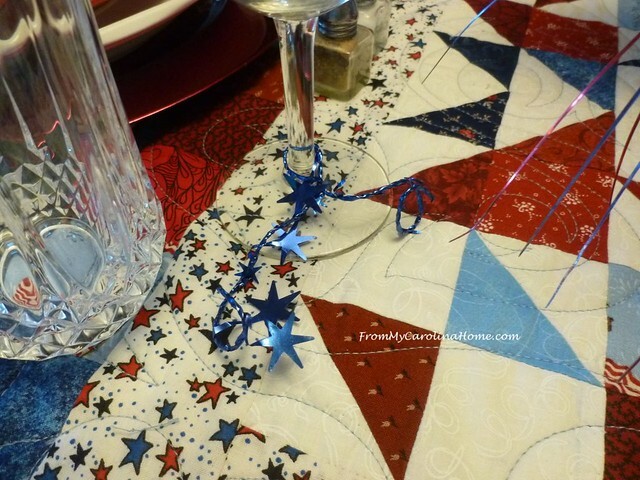 I especially love red, whit, and blue table-topper on the pub table. Enjoy the day! Happy Fourth! Be safe & enjoy! 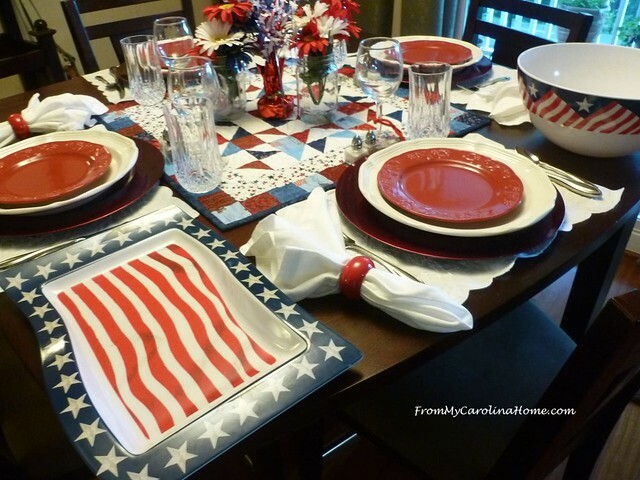 Happy Independence Day, what beautiful place settings! When I saw the red baskets I immediately got hungry for french fries! How very festive! Sometimes I feel like a resident of Middle Earth with the table and your ideas are so very helpful!! Thanks!!! Have a great fourth~!!!! 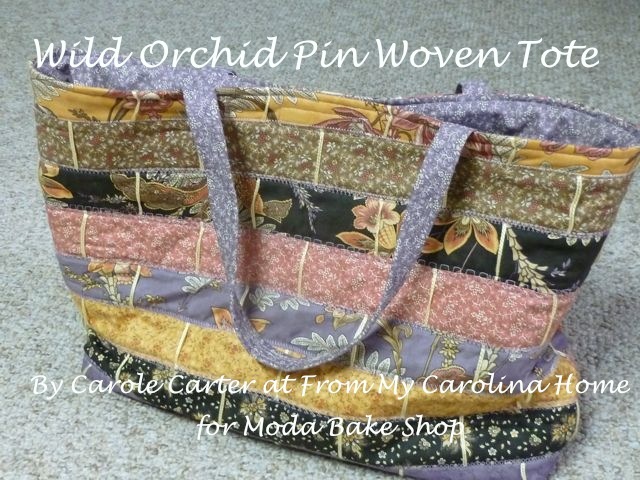 Some nice ideas as always, Carole! 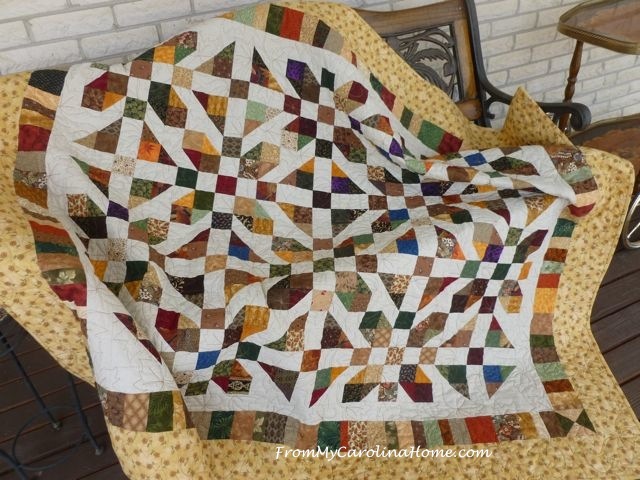 I really like your vintage, use what I have vibe! 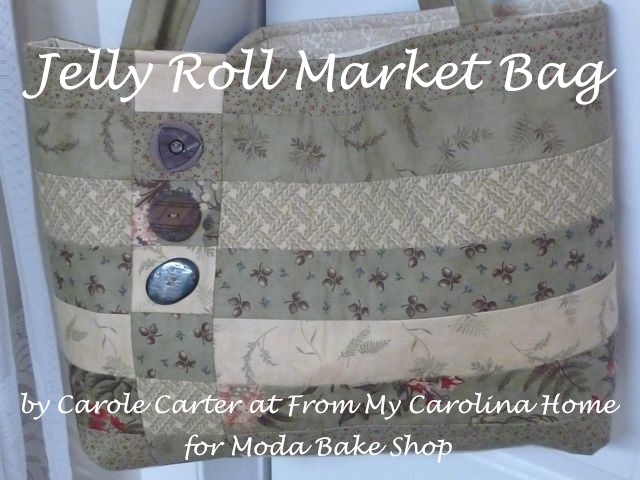 Happy 4th of July Carole; Each one of your tables are delightful and so full of spirit! I enjoyed the subtleness of the first table, it is so pretty and proud. I love how you are ready to change things up at a moments notice to suite the demand. The second layout worked beautifully. I also enjoyed the third table decorations with the table topper and the glitter and glam. You are a magnificent decorator! Thank you for sharing and have a marvelous day! These table settings are so fun and sweet. Carole, I love the way you have transformed the mason jars into candleholders. Thanks for sharing! Your tablescapes are always so unique and beautiful. So we started celebrating early yesterday and made the crescent roll hot dogs for lunch. 🙂 My husband is now your fan as he also Loves (!) the crab salad with the Scirachi dressing. Hope you have a Happy 4th! 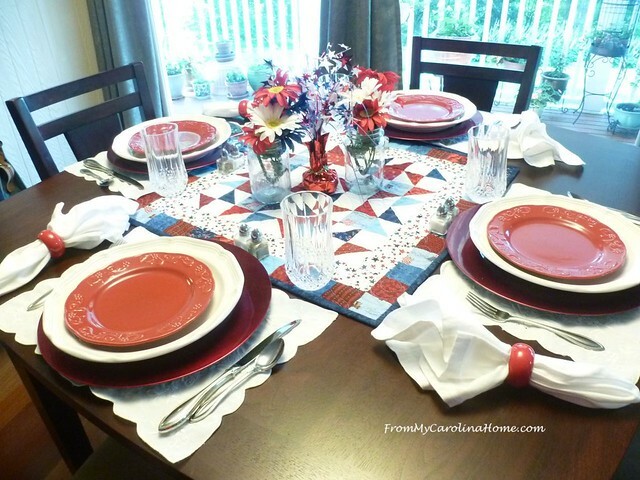 Love the red, white, and blue theme and so very appropriate! My neighbor 2 doors up is having a block party for our street, serving hot dogs and hamburgers and all of us participating will be taking side dishes. I made regular deviled eggs and avocado deviled eggs topped with grape tomatoes halved on each. Served the avocado with pepperoncini dividing the eggs and green onions dividing the regular eggs. Had trouble locating my egg plates so just put lettuce shreds into a large square holder and placed the deviled eggs on top so they wouldn’t slide all over the place . Hoping the weather want rain and be too hot but the humidity is so high so not really looking to have much relief there. Again happy holidays and stay safe. 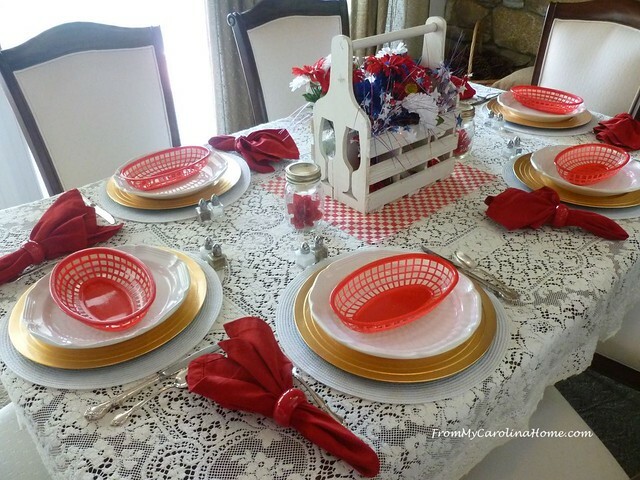 Lovely tables plural Carole….and I especially love the square centerpiece of your high top table. Have a safe and happy 4th of July…we are callin’ it casual here at Villa de la Luna. 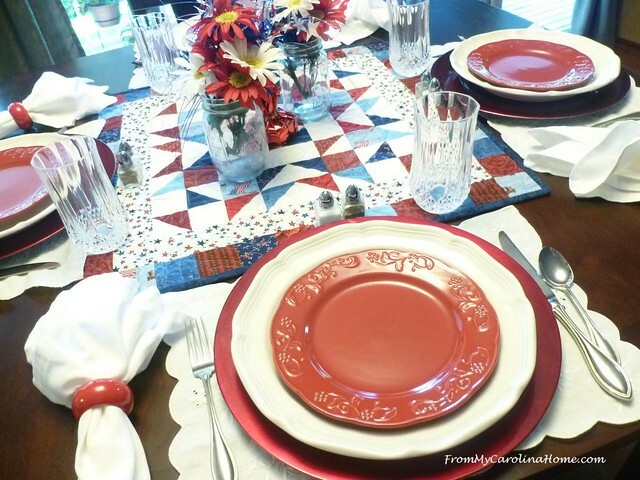 Lovely tablescapes! I like that they are fun and festive, with a bit of gold, but not to fancy for picnic food. Have a good holiday! 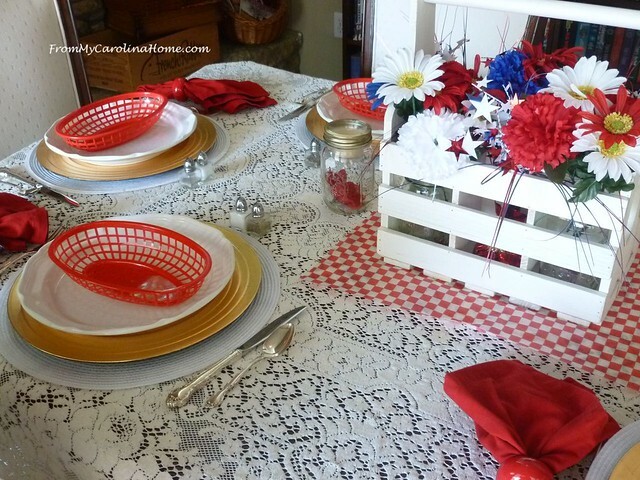 Lovely table settings…makes for happy times..
Carole, I remember the little plastic red baskets from days gone by. I love both tablescapes!